Meijer Development TIA - TADI - Traffic Analysis & Design, INC. Meijer Development TIA - TADI - Traffic Analysis & Design, INC.
TADI's Role: To determine future modifications to Taylor Drive and Erie Avenue with redevelopment of the Memorial Mall site. Portions of the mall will be razed to make room for the Meijer development and the main site driveway at Taylor Drive will be relocated to fit the reconstructed site layout. 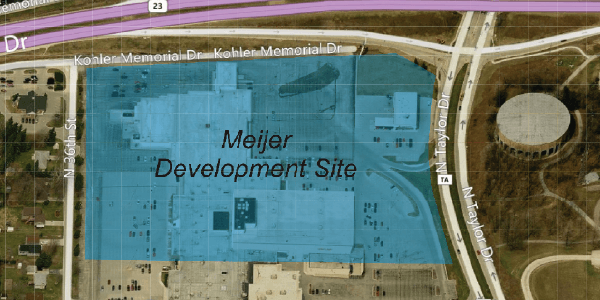 A Meijer store with an on-site fueling station and retail outlot is proposed to be constructed on the Memorial Mall site west of Taylor Drive in the City of Sheboygan, Sheboygan County, Wisconsin. Portions of the existing Memorial Mall and Firestone buildings will be razed to make room for the proposed Meijer development. Access to the proposed Meijer store will be through the existing mall access drives to Erie Avenue and Taylor Drive, although the locations of the Taylor Drive access points are proposed to be changed to accommodate the Meijer development site layout. TADI collected peak hour traffic counts at the existing Memorial Mall driveways to determine the amount and locations where traffic would be reduced once the existing uses are razed. The new trips for the proposed Meijer development were calculated using the ITE Trip Generation Manual and assigned to the site driveways and study intersections to generate a new total traffic volume scenario. Based on the traffic analysis of the new total traffic volumes, it was determined that the relocated main site driveway to Taylor Drive would require traffic signal control in order to provide acceptable delays and queues during the peak hours. A signal warrant analysis was conducted to verify the placement of signals at this location, and a progression analysis was conducted to develop timing plans that minimized traffic queues between the relocated driveway and the Taylor Drive/Erie Avenue intersection. Other intersection modifications recommended from this study included the additional of right-turn lanes on Taylor Drive at the site driveways to improve safety between vehicles entering the development and through traffic on Taylor Drive.